Direct reduced iron (DRI) is also known as sponge iron. It is produced by the reduction of iron ore (in the form of lumps or pellets) by either non-coking coal or a reducing gas produced by reforming of natural gas. The reducing gas can also be produced by the gasification of coal. The reducing gas is normally a mixture. The majority gases in this mixture are hydrogen (H2) and carbon mono oxide (CO). These gases act as reducing agents. 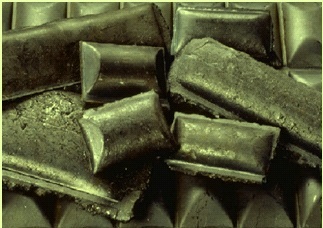 The reduction process is conducted at high temperature but substantially below the melting point of iron. Since the reduction reaction takes place in solid state, the lump or pellet retain their original shape, but are considerably lighter due to the removal of the oxygen from the ore. Hence the produced direct reduced iron has a highly porous structure. This porous structure gives DRI an appearance of a sponge and because of it, DRI is also known as sponge iron. Iron content in the DRI is in two forms. One is in metallic form which is known as metallic iron, Fe (M), and the second form is iron present in residual iron oxides, Fe (O). The total iron Fe (T) in DRI is the sum of these two iron components. Metallic iron is the aggregate quantity of iron, either free or combined with carbon (as cementite) present in DRI. Metallization of DRI is a measure of the conversion of iron oxides into metallic iron (either free or in combination with carbon as cementite) by removal of oxygen due to the action of the reductant used. Degree of metallization of DRI is the extent of conversion of iron oxide into metallic iron during reduction. It is defined in percentage of the mass of metallic iron divided by the mass of total iron. As DRI is made by reducing gases, it has a porous, sponge like form. Consequently, it has a large surface area relative to its mass, which enhances its reactivity. If it becomes wet, it oxidizes and liberates hydrogen gas from the water. This particularly is true if the water contains dissolved salts such as sodium chloride (e.g. sea water). As part of the reaction, it heats up significantly, which further stimulates the oxidation of the still dry lumps or pellets, resulting in chain reaction that spreads rapidly throughout the DRI pile. When sufficient oxygen is available, temperature can reach as high as 1500 deg C. If stored in a closed environment, such as a ship’s hold, the hydrogen liberated crates a potentially explosive mixture. Further, ventilation to remove the hydrogen would enhance the oxidation, and thus the overheating. Freshly produced DRI is very reactive to humidity and oxygen. The following three methods are used for slowing down of the oxidation rate of DRI. The process of slowing down of the oxidation rate is called ‘Passivation of DRI’. The first and simplest passivation technique is to allow DRI some time to age. Exposure of DRI to air creates a very thin layer of oxide on the surface of DRI. This layer retards the rate of further oxidation. Sometimes passivation is carried out first circulating nitrogen mixed with small oxygen through the storage area for a few days followed by ageing in an enclosed ware house for two to three weeks. This passivation technique is normally used when the DRI is used at adjacent steel melting shops or are to be transported to nearby locations. The second method of retarding the oxidation rate is to coat the DRI with a chemical (e.g. sodium silicate – water glass) that protect it from the air. This has proven effective against overheating in case of contact with fresh water but is not effective against sea water. The third and most effective means of slowing oxidation is by addressing directly the source of the problem i.e. by lowering the surface area of the DRI and increasing its thermal conductivity. This is carried out by compaction of the DRI as soon as it is produced at temperatures at or above 650 deg C, into briquettes of minimum density of 5.0 gm/cc, so as to close most of the pores in the material. The product is known as HBI. HBI is a relatively safe form of DRI which is suitable for bulk shipment and outdoor storage. DRI is produced in many forms. These are lump, pellets, hot briquetted iron (HBI), fines, and cold briquetted iron (CBI). When DRI is discharged from the furnace in cold condition (temperature around 50 deg C) then the product is known as cold DRI (CDRI) and when DRI is discharged in hot condition (temperature around 650 deg C) for use in hot condition in steel melting shop then the product is known as hot DRI (HDRI). The International Maritime Organization (IMO) describes direct reduced iron in three categories consisting of (i) DRI (A) – Hot moulded briquettes, (ii) DRI (B) – lump, pellets, and cold moulded briquettes, and (iii) DRI (C) – by product fines. The average particle size of DRI in case of lumps and pellets is 4 mm to 20 mm while that in case of fines is up to 4 mm. Typical size of CBI is 16-24 mm x 20-30 mm x 40 – 50 mm while typical size of HBI is 30 mm x 50 mm x 110 mm. HBI has got a pillow like shape. Few pieces of HBI are shown in Fig 1. The analyses and the specifications of different types of DRI are given in Tab 1. The use of DRI has the following advantages over the use of scrap during steel making. Since DRI has practically no tramp elements, it allows steel making to dilute metallic residuals in scrap. Hot charging and continuous charging is feasible in EAF with DRI. Since DRI has higher carbon than scrap, it reduces the amount of carbon injection during steel making in EAF. Bulk density of DRI is higher than scrap.